Chinese regime leader Xi Jinping is rocking so many boats on the political front that he wants to make sure the economy and financial markets remain stable in 2017. He even said he prefers stability over meeting the regime’s GDP growth target. The past year was a partial victory, as the regime managed to contain massive capital outflows, labor market stress, and stock market crashes by using the usual tactic of pushing hundreds of billions of dollars into the economy through the state banking system. But underneath the surface, risk in financial markets keeps building. Xi recently admitted at a secret meeting that China may not meet its target for GDP growth if doing so creates too much risk, according to a Bloomberg report. As long as the economy and employment remain stable, growth can slip below the 6.5 percent target. “Investors may obsess over GDP, but the Party can demand any GDP figures it wants. What matters to Beijing is joblessness. If net hiring looks good, the government has little reason to act, even if other indicators show results which disturb markets,” states a report by research firm China Beige Book (CBB). CBB has made a name for itself by providing accurate on-the-ground data for China’s economy, as official figures are often unreliable. The researchers interview thousands of companies and hundreds of bankers in China each quarter to get an accurate gauge of the themes in the Chinese economy. 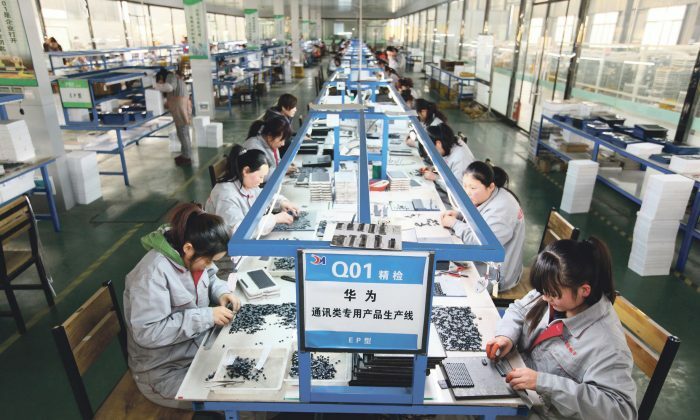 The latest report reflects the narrative of the Chinese regime as well as Western analysts: The economy has stabilized thanks to stimulus, and the labor market is also stable. It takes 83 days for the average Chinese firm to get paid, almost double the time it takes in other emerging markets. Revenues in retail, the service sector, manufacturing, transportation, real estate, and the commodity sector increased at more than 50 percent of the companies surveyed in the fourth quarter of 2016, a good indicator of solid GDP growth. Overall profits increased as witnessed by 47 percent of companies and 43 percent of firms hiring more workers. However, stability in China is a double-edged sword for Western investors. If things are good, more stimulus is probably not forthcoming. “In the fourth quarter, net hiring looked very good, leaving no reason for stimulus in early 2017,” states the CBB report. This gain in growth and hiring came at a price, however. Profits and revenues at firms are rising, but the cash doesn’t show up at the firms—a potential signal of financial stress. “Cash flow pain persisted, with the year-on-year results rather eye-catching,” states the report. Much of the cash flow from a company’s operations is determined not only by how much the company sells but also, much more importantly, by how much of that money it receives and when. If a company is still waiting for payment, the money is booked under a category called “receivables.” This category got bigger in 22 percent of the companies CBB surveyed and decreased in only 15 percent of the firms in the survey. Likewise, if some businesses have to wait for money, they are going to delay payments to their suppliers (“payables”). The payables category got bigger in 26 percent of companies and decreased in only 17 percent—some of the worst readings in CBB’s history. A survey by Bloomberg earlier this year showed that it takes 83 days for the average Chinese firm to get paid, almost double the time it takes in other emerging markets. As for paying out, Chinese companies are even slower. Euler Hermes, a company that specializes in trade credit insurance, shows that Chinese companies took 88 days on average to pay their obligations in 2015. Another drain on cash is a rise in inventory. The companies spend money to produce goods but don’t sell them for the time being. Inventories got bigger at 39 percent of the firms in the fourth quarter, the largest increase on record for the CBB survey. The long delays in settling bills could be a sign that payments for interest and debt—another negative for cash flow—are overwhelming companies. If these payments become too large, the companies have to squeeze operational cash flow to keep on going or borrow even more to make their immediate payments. “Cash flow could explain why firm borrowing in the third and fourth quarters hit the highest levels CBB has reported since mid-2013. Firms may not be borrowing to fund expansion, but rather to cover shortfalls,” states the report. If firms can’t borrow more or squeeze their suppliers, they will go bankrupt. According to research by Goldman Sachs surveying companies in China, four have defaulted on $3 billion worth of bonds since the middle of November. These defaults are a break with the record in the previous five months from June to October, when only three of the companies surveyed didn’t meet their payments. Given that China’s companies are drowning in debt, this squeeze on cash flow does not bode well for stability in 2017.